Before i will tell you step to get this offer i just clarify you at start that this Rs 150 you get in two parts by downloading thier app you will get rs 10 instant and another Rs 140 after 60 days so do’t uninstall the app till and in refer and earn program rs 130 in three parts By refering you will get Rs 10 instant when your friend download the app in second Part you will get Rs 20 when your friend download the app and another Rs 100 when friends earn rs 160 in earn talk time. So If you still not installed amazon app in your mobile or you have purchased new phone then you have great chance to enjoy this both offer via Earn talktime . Now open the app and create account with your detail. After creating account on home page of app you see amazon Rs 150 offer. 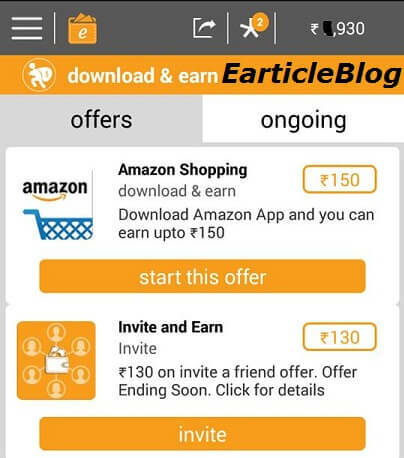 Just click START THIS OFFER now you will see detail of app after that click DOWNLOAD NOW button. 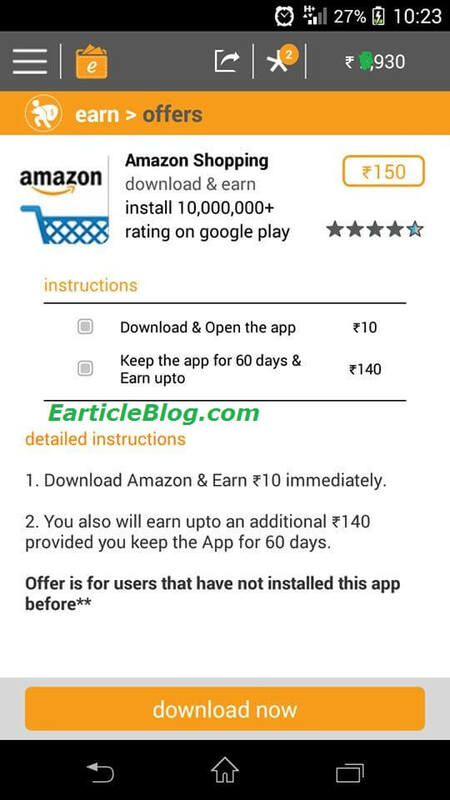 You will redirect to play store now install the amazon app and sign in the app. You will get Rs 10 instant and Rs 140 after 60 days. Open the earn talk time app and See invite and earn option. Click on it collect your referral link and share with your friend . And ask your friend to download amazon app or another offers. As your friend downloading app you start earning rewards. In amazon offer you need fresh device in which amazon app not installed previously then you get rs 150. For complete detail visit app. So Guys Hope You get an idea of what is Earn talktime and how you get Up to Rs 150 per refer and also enjoy lots of free talk time via this app. One more thing which i want to tell By using earn talktime app you can reddem it on various Rewards like Free paytm cash ,Free amazon vouchers ,or Mobile recharge ,DTH recharge , bigbazzar vouchers etc.So do’t forget to enjoy this amazing app and earn Unlimited Money . Trick To Watch Youtube Videos Without Internet!